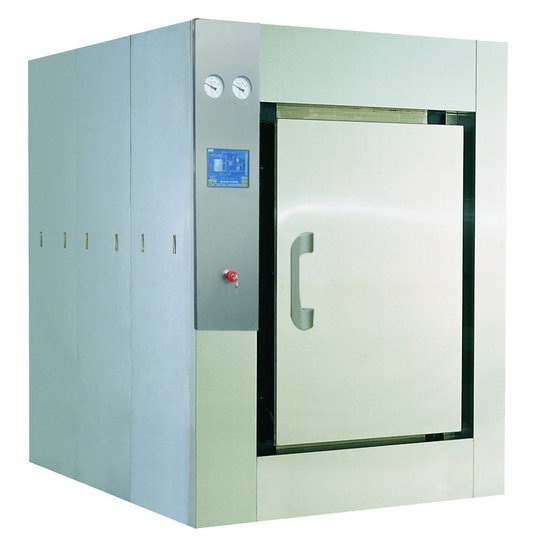 Pulse vacuum sterilizer is specially designed to sterilize the goods that have strict requirements such as biology products, utensils, instruments, tools, dressings, sterile clothes etc. in the shortest time. It is widely used in biology product, pharmaceutical industry, supplying and surgical rooms in hospital and laboratories. This series of sterilizers are welcomed by the customers, and can substitute imported ones. Vacuum program: Used to sterilize dressing, sterile clothes, metal instruments and tools, utensils etc. various medical materials. Instrument program: Used to sterilize metal surgical instrument and tools, sterile utensils etc. Liquid program: Used to sterilize small amount of liquids in supplying and surgical rooms. B-D testing program: Used to carry out B-D test to inspect the sterilizer if in normal state. The inner shell of the door is made of high quality stainless steel, it is polished mechanically and chemically, which makes it smooth, and erosion resistant. The auto welding eliminates the defects caused by manual operation. The sealing door can be lifted and dropped automatically, which is avoided to be opened during operation by mechanical and electronic devices. There are 2 kinds of sterilizers in this series, one has I door, the other has 2 doors. The 2 doors can be interlocked to ensure the isolation between clean and sterile rooms. The sealing ring for the door is made of silicon rubber ring with heat resistance and elastic. It can endure high temperature over 200℃ so that its long life is guaranteed. l Water cycle vacuum pump discharges air in the chamber forcibly, the sterilization is thorough and the drying effect is satisfactory. l The whole process is controlled by computer reliably, the process parameters can be recorded automatically. l All the parts being provided by famous companies in the world, the advancing and operation without failure over long time are ensured. l High performance cost ratio. l Fine outlook and wonderful working environment.